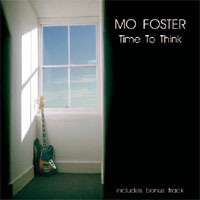 MO FOSTER has already had his previous studio albums released on Angel Air ‘Bel Assis’ and ‘Southern Reunion’ to great critical acclaim. Now his third album recorded in 1999 is given its first major release having previously only been available from his own small label. ‘Time To Think’ is essentially an acoustic album in an ambient space (St Michaels Church, Summertown, Oxford) The music was interpreted by the talented musicians Mo had assembled who improvised melodically, kept perfect time and whilst doing all that, swing like the clappers! ...it is one for fans of jazz rock. Lovely clear sound throughout...nice easy listening.